Game of Thrones has built quite a reputation for itself. Not only is it the most popular show on TV, it’s also the most expansive in terms of both storytelling and fan base. Which is why the leaked episodes and the overwhelming response that followed didn’t surprise me. Audiences clearly want to dive back into this cold hard world. At the end of this season’s lukewarm opener, “The Wars to Come,” it’s hard not to clamor for more. 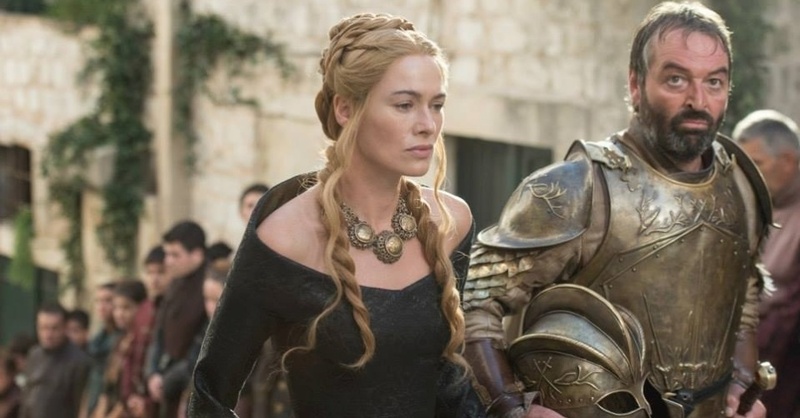 So much has happened following last season’s staggering finale. The birth of Darth Sansa, the death of Tywin Lannister, Tyrion & Arya’s departure from Westeros, Stannis’ arrival at The Wall. The characters need some time to process it all in the wake of these significant game-changers. This is exactly the strength of this episode and its weakness as we are shown various viewpoints that reflect on the major events of last season. By default, that means we have to tread through familiar ground as well. The title of the episode is “The Wars to Come,” meaning that the show setting up for some big things to happen. We began with the series’ first ever flashback. A young Cersei receives a rather prophetic glimpse into her crumbling future, which, on the steps of the Red Keep, she realizes have all but come true. The Lannisters are now a house divided, and the Tyrells are on the verge of eclipsing the once powerful family. It appears Margaery is looking to become a more malevolent player in the game. 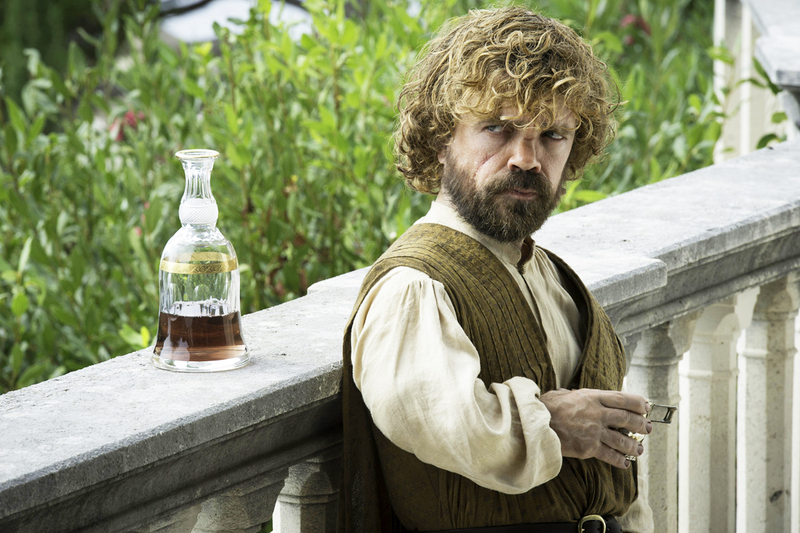 Perhaps the biggest set up is that of Tyrion, whose drunken eye is now set on finding Daenerys, at Varys’ behest. As a reader of the books who knows very well how close yet so far Tyrion is to meeting her, I can only hope the show will treat us to what fans are impatiently waiting for, for the Imp to finally meet the mother and her dragons. The most startling events in this episode happened in Meereen: the Unsullied coming under threat from the Sons of the Harpy. The dragons having grown in tremendous size and temper, and their mother no longer able to control them. But the most resonant image was the tearing down of the statue of the Harpy. 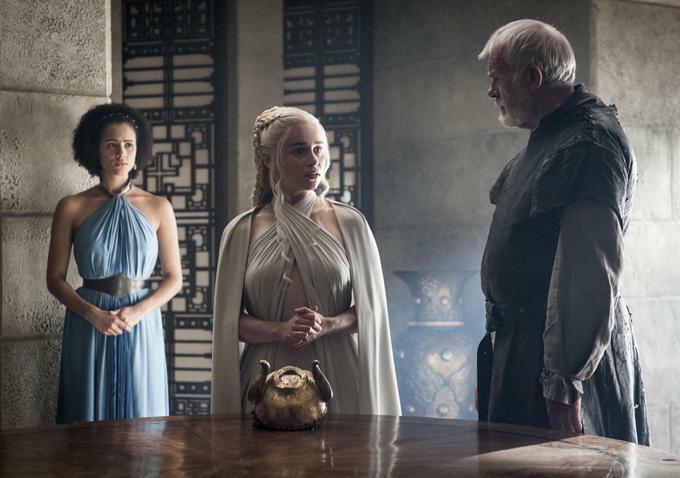 It’s symbolic of the change that Daenerys hopes to bring to this world. But is it also foreshadowing the collapse of her own empire? We will have to wait and see. 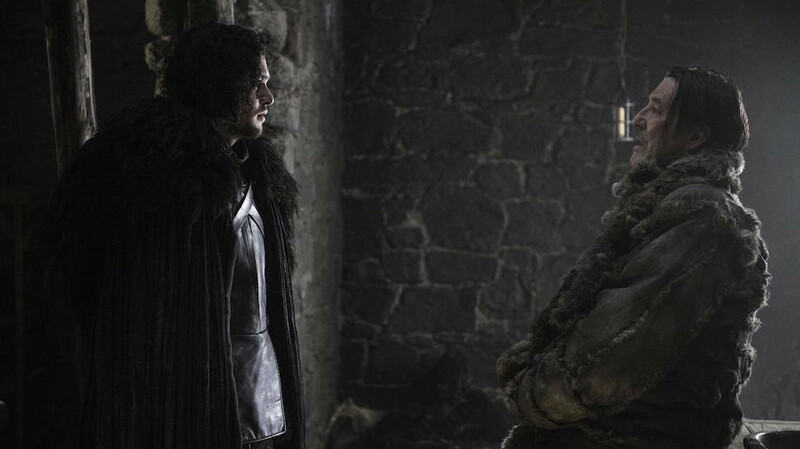 Another major thread occurred on the Wall, with Mance Rayder choosing to burn rather than bend to Stannis. King Stannis was hoping to use the former King Beyond the Wall to broker a deal with the wildlings, offering them a rightful place in the North in exchange for retaking Winterfell. It appears Stannis will have to do things the hard way. But is his decision to burn Mance symbolic of the Lord of Light’s reign over Westeros? Or does it foreshadow his inevitable demise? Considering the nature of this show, you have to be careful of who you root for. Because you can never know if a character’s actions will advance them to another rung on the ladder, or set forth a chain of tumbling dominoes. It is always exciting to get thrown back into the many cogs of this complex and detailed world (we only get 10 episodes a year!) But, as viewers, we come to expect more in these premieres alone, especially when, in prior seasons, the show managed to kick things off rather quickly. I guess this is more of a testament to the show’s power, but it is a shame that this episode didn’t advance much of the plot (we didn’t even get to see Arya or the fallout in Dorne). After all, A LOT happens in A Feast For Crows and A Dance With Dragons, which, I presume, is the massive canvas that season 5 is aiming to journey across, with or without the help of the books entirely. Now, much has been said about the show beginning to stray from the material and I think it’s a smart move on the showrunners’ part. Sure, they’ve been making strides in that direction already by getting rid of certain subplots or streamlining them altogether (they included Varys in Tyrion’s story, which is an intriguing choice in of itself). They’ve even managed to kill off characters that are still alive in the books (like Mance Rayder, whose true fate I’m still unsure of). Nevertheless, it’s a bold move that will enable the show to finally step out of the daunting shadow of the books. For now, the show is just getting out of the shadow of season 4. In terms of the massive chessboard that the series has created, “The Wars to Come” was more of strategically setting up the pieces as opposed to making any real moves. But, as always, there’s plenty to look forward to on the horizon. So let’s all enjoy a horn of ale before the war.